WWe invite you to take in the beauty of sunrises and sunsets over the mountains. Privacy, Luxury, Beauty, Peace: We heard you! 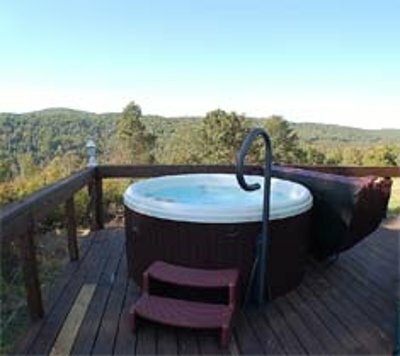 For that ultra-special honeymoon, anniversary, or romantic getaway, you want complete privacy, peace and quiet, elegant furnishings, luxurious amenities AND StoneWind's signature hot tubing under amazing night skies. With indoor elegance in the midst of rugged mountain beauty, the Sanctuary Suite features carpet and tile flooring, graceful furnishings and decor, including a custom King Bed, a washer and dryer, a fully furnished kitchen with a blender, and extra special amenities, including a hairdryer, personal bath robes, and free wifi. Its main deck is surrounded to the rear by a private stone garden with a stone table and by a grove of trees plus a second deck with table and chairs. 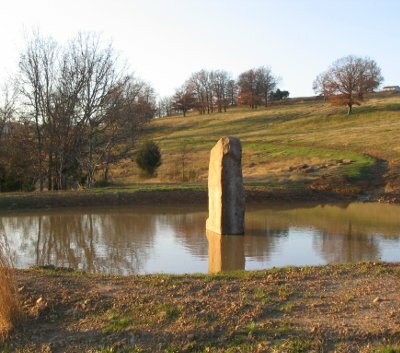 In front of the Sanctuary Suite is a private pond with a standing stone rising from the water and a rock garden with another standing stone. 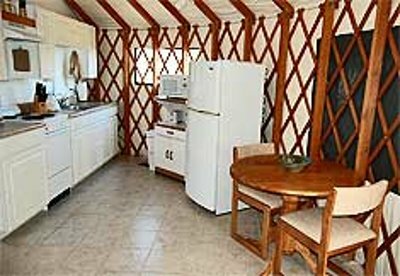 Everything at StoneWind invites you to rest, relax, and reconnect with the beauty and rhythms of nature, with the healing energies of Earth and Wind. Not a bad way to live... a good place to visit. 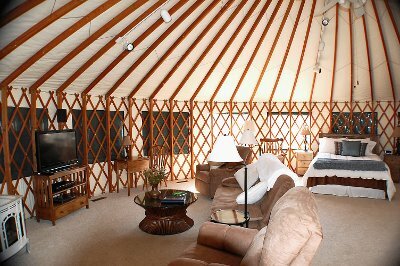 an elegantly furnished yurt with a special view and all the amenities of the Sanctuary Suite! This site and its contents © 2015 StoneWind Retreat. All rights reserved.